Take a pedicab ride along the off-the-beaten Hutong (traditional alleyways in the neighborhoods) at the Southwest corner of the Tian'anmen Square- very heart of old Beijing city, have a glimpse at the life in the local hutongs (a network of narrow streets and alleyways that make up a preserved neighborhood of old Beijing), where the courtyard houses have been kept intact and people's life style has changed much here. 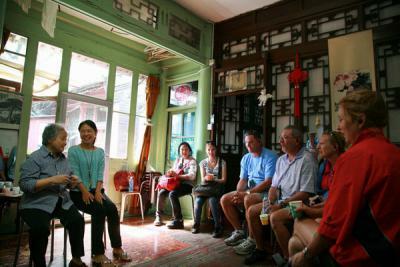 Have some tea and a chat with residents of a traditional courtyard house and a walk through the Hutong market. 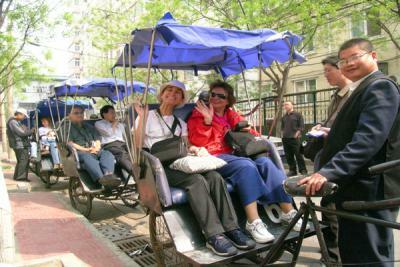 It includes English-speaking tour guide, pedicab ride and homevisit. Payment Methods: Please click the link here for all six payment options. Since the day tours and classes involve relatively small amount of money, we recommend you to ask your Chinese friends or colleagues to help you transfer the money by WeChat Wallet or Ali Pay, the easiest and fastest ways to make payments in China. Note: We need at least 4 people to offer this tour. Once there are 4 persons made the payment, we will guarantee it. If there are less than 4 paid for the tour, then we will refund your payment or talk with you about a private tour. Prepayment shall be made at least one working day before 5pm Beijing time prior to the tour/class time (before Friday 5pm if the tour/class is on Sunday), so CCC staffs are able to check and confirm. If you use international credit card wire the fee (which may take some time), please send us a photocopy of your receipt (a picture by your cellphone) to prove. Cancellation policy: If you have to cancel after you made prepayment, please let us know (by phone call) 48 hours in advance. 20% of tour/event fee will be charged for cancellation if you do it within 48 hours, 50% of tour/event fee will be charged if you cancel within 24 hours’ notice. 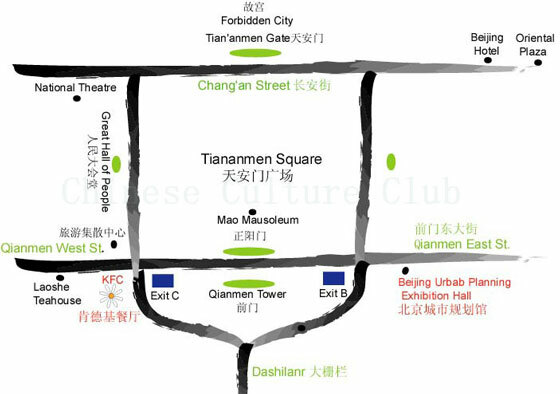 KFC restaurant near the southwest corner of the Tiananmen Square. Hutongs are a type of narrow streets or alleys, most commonly associated with Beijing, China. In Beijing, hutongs are alleys formed by lines of siheyuan, traditional courtyard residences. Many neighbourhoods were formed by joining one siheyuan to another to form a hutong, and then joining one hutong to another. The word hutong is also used to refer to such neighbourhoods. Hutongs represent an important cultural element of the city of Beijing. 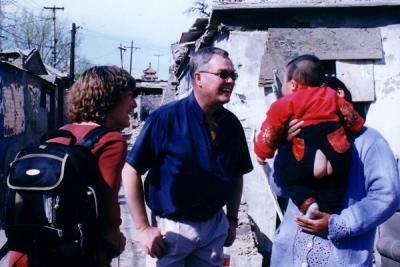 Thanks to Beijing’s long history and status as capital for six dynasties, almost every hutong has its anecdotes, and some are even associated with historic events. In contrast to the court life and elite culture represented by the Forbidden City, Summer Palace, and the Temple of Heaven, the hutongs reflect the culture of grassroots Beijingers. 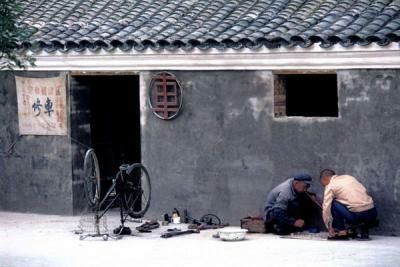 The hutongs are residential neighborhoods which still form the heart of Old Beijing. 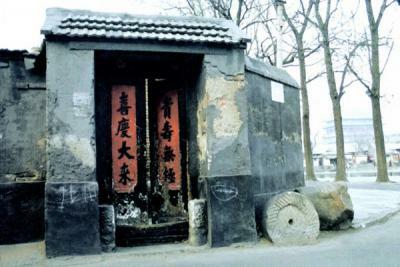 A siheyuan is a historical type of residence that was commonly found throughout China, most famously in Beijing. In English, siheyuan are sometimes referred to as Chinese quadrangles. The name literally means a courtyard surrounded by four buildings. Throughout Chinese history, the siheyuan composition was the basic pattern used for residences, palaces, temples, monasteries, family businesses and government offices. In ancient times, a spacious siheyuan would be occupied by a single, usually large and extended family, signifying wealth and prosperity. Today, many remaining siheyuan are still used as housing complexes, but many lack modern amenities.